Welcome to Comic Kudos, where I praise comics that I enjoy! For the first article, I figure I would praise one of the most consistently awesome comics I've read in the past year, but one that I haven't heard much buzz about: Silver Surfer by Dan Slott (Amazing Spider-Man) and Michael and Laura Allred (FF, iZombie, Madman). "Anywhere and everywhere — hang on!" What is this new Silver Surfer series about? Well, besides the silver dude, the main character is Dawn Greenwood, a young woman from Anchor Bay, Massachusetts, who helps her parents run the Greenwood Inn. Until she is kidnapped by aliens! Why is she kidnapped by aliens? Because they want to force Norrin Radd, the Silver Surfer, former Herald of Galactus, to protect the impossible planet the IMPERICON from the NEVER QUEEN. Why kidnap Dawn Greenwood, though? Because Dawn Greenwood is the most important person in the Silver Surfer's life...or, at least, she will be, because the Silver Surfer doesn't know who she is at all right now. The whole series is just fun. It's cosmic, space opera stuff that doesn't treat anything too seriously. The Silver Surfer is the same stoic dude as before, but Dawn manages to bring out more of a fun side to him. She even names his board — Toomie, because whenever he calls it, he proclaims, "To me, my board!" 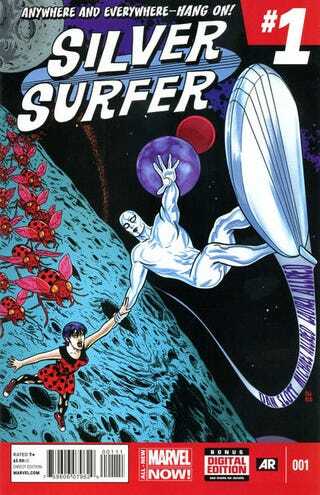 (In fact, she evens out some of the Silver Surfer's more pompous/silver-age-y moments.) And, despite the fact that she is kidnapped early on, she never acts as a damsel in distress. The first story arc, with the Impericon and the Never Queen, is fun and interesting and provides a nice number of twists and manages not to go on for that long. In fact, it only lasts three issues...and the next arc lasts two, making a pretty good collection for the first trade paperback (called, appropriately, "New Dawn"). The fun is also in seeing the very cool artwork by Michael Allred on pencils and Laura Allred on colors. Even in an issue that takes almost almost entirely in darkness (Issue #7, "We Are Sailors On an Endless Sea of Night") looks fantastic. All the interesting designs, combined with the fun story and dialogue by Dan Slott, makes this book one of the ones I anticipate each month (and am constantly afraid is going to get cancelled after what happened to She-Hulk).